Every financial organization is trying to find ways to become more efficient and more effective in their marketing efforts. This includes investing in new technology to assist in the implementation of marketing strategies as well as trying to leverage internal and external data to improve personalization and overall results. We are seeing an increased emphasis in marketing techniques that utilize mobile devices, interactive content, website-based selling and brand development. Unfortunately, the financial services industry has continued to lag other industries with the move to digital strategies. We also continue to see a lack of using advanced analytics for improved targeting and enhanced measurement of results. In this sixth year of measuring financial marketing trends, we continue to see a strong focus on new customer/member acquisition as well as a desire to cross-sell and up-sell services. By comparing results of this year’s survey with those of previous years, we see marketing technology investment strategies that are more modest than we believe is needed to ‘move the needle’. We would like to thank Deluxe, Inc. who sponsored this year’s survey development and distribution for the second time. Their partnership enabled us to continue to do the most comprehensive marketing trend analysis in the banking industry. 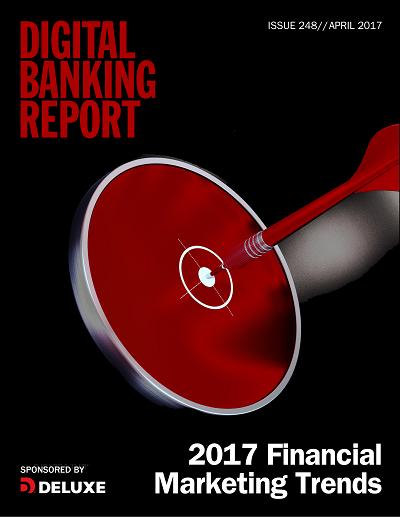 The 78-page Digital Banking Report, 2017 Financial Marketing Trends provides a good benchmark of where the industry is headed from a marketing perspective. More importantly, this report provides the foundation for financial marketers to begin internal discussions to change the way banks and credit unions do marketing. Annual survey-based update on the key trends shaping bank and credit union marketing objectives and investments globally.